Love is in the air! February is all about heart-shaped valentines, sweethearts and heart health and so I thought I’d spread a little Canadian Turkey love with a few tips on how turkey can help you be good to your heart. According the to the Heart and Stroke Foundation of Canada, Canadians are eating too many ultra-processed foods and it’s not good for our hearts. Yikes! They state that one of the most important things you can do for your heart is to eat a healthy balanced diet that includes a variety of whole, minimally processed foods. Think foods such as lots of veggies and fruits, whole grains, nuts and seeds, poultry (turkey!) and fish. Choosing mostly whole unprocessed and/or minimally processed foods. Eating more freshly prepared meals made with mostly whole food ingredients. When you think about it, that’s really just getting “back to the basics” with wholesome foods and cooking more at home. Easier said than done? Here are a few pointers to help you out. Stock your kitchen with wholesome, real food ingredients. 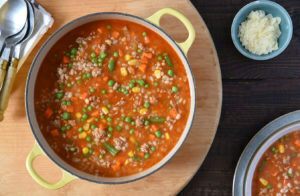 Some examples of heart-healthy foods to choose: fresh turkey, carrots, barley, frozen peas, and canned low-sodium tomatoes. Oh hey, those are all ingredients for this delicious Quick and Hearty Turkey Barley Soup. Give it a try! Do a little meal planning – even just a few meals for the week helps – so that you know what to buy. Knowing what ingredients you need before you go saves you time and money. Canadian Turkey has a huge selection of nutritious recipes that can give you some inspiration. How does turkey fit in? White meat is a low fat, extra-lean choice with just 3 grams of fat per 100-gram serving. Dark meat is lean, with just 8 grams of fat per 100-gram serving. Plus, dark meat gives you an even bigger boost of selenium, an important heart-healthy antioxidant mineral. Most of the fat in turkey is monounsaturated and polyunsaturated. In fact, almost half the fat in turkey is monounsaturated – that’s the same type of fat found in heart healthy olive oil! Once your kitchen is stocked with minimally processed, whole food ingredients, get cooking! When it comes to healthy eating, one of the most positive steps you can take is to cook more. When you cook your meals from scratch, it allows you to control what goes into your food. For example, you can add less salt (too much is not good for your heart) at home than manufactures add to convenience foods and ready-to-go meals. 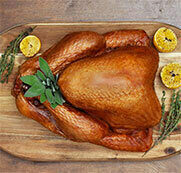 Turkey talk: All fresh cuts of turkey are naturally low in sodium. ** And because it’s super tasty, you don’t need salty marinades to make it taste good. “But I don’t have time” you might be saying. As a health professional and busy mom, I understand the time-crunch and how it impacts what you do in the kitchen. And that’s why I love to cook with whole turkey! On the weekend, I’ll roast a whole turkey or batch-cook a bunch of turkey pieces (e.g. a couple of breasts or several thighs). My family and I enjoy a weekend turkey dinner together and then I use the extra turkey to make quesadillas, sandwiches and salads during the week! Win-win-win! This month, I hope you take a couple of steps backwards – back to basics that is! Why not start with a whole turkey dinner for all your loves on Valentines Day. ** Each 100-gram serving of turkey provides 51 – 78mg of sodium (white and dark meat respectively).